As frequent readers will know, I admire and value pass-alongs and the memories they contain. For today’s design I have featured cut peonies in a striking red color. These were shared by a friend last week and came from a plant originally grown by her mother. A search to learn the name of the peony yielded dozens of possibilities, so I nicknamed it ‘Cherished Red’ for today. Recently in other Monday vases I have seen herbs used to create a soft, airy effect. I used last year’s cilantro that has been flowering for several weeks to lighten the red. 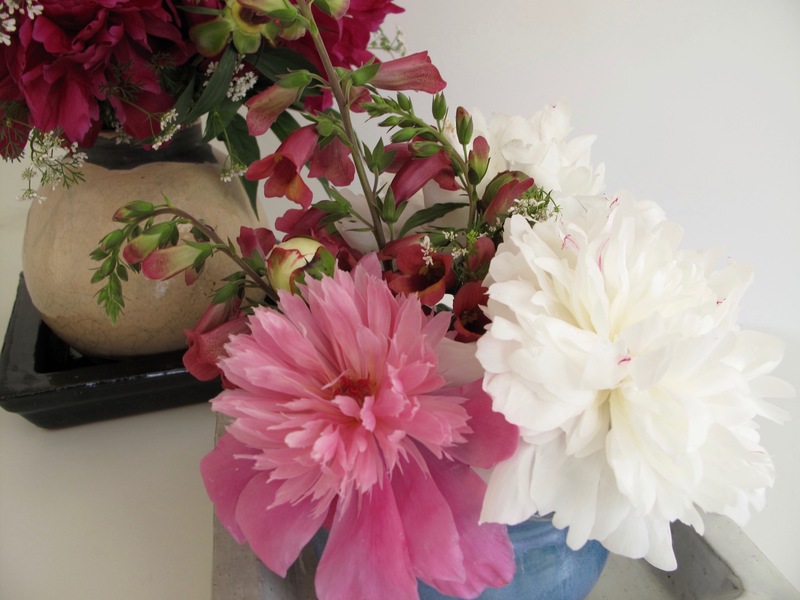 From my peonies I cut several stems of P. ‘Festiva Maxima’ and a pink anonymous one. A branch of Ruby Glow Foxglove broken during a severe evening storm provided more blooms than I would have ventured to cut myself. The red peonies had lovely long stems, but not so the others. 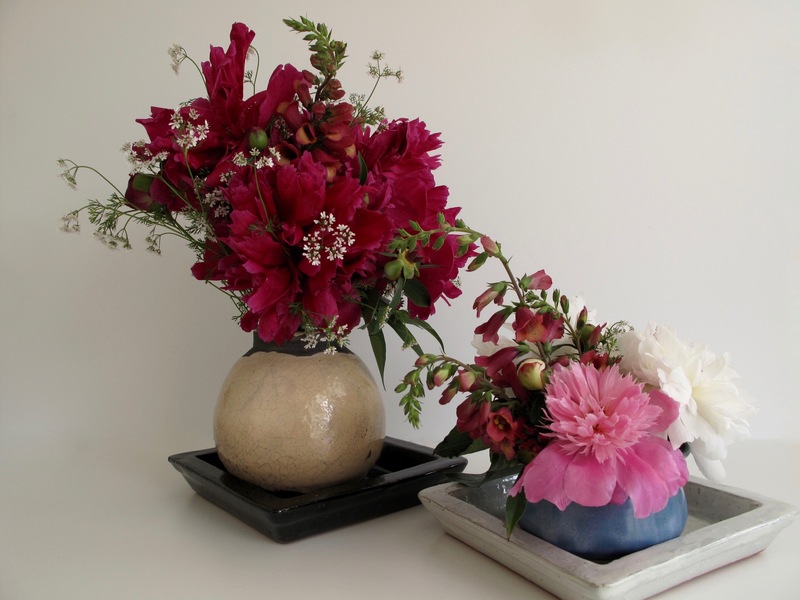 To use them all I divided the flowers between two ceramic containers of differing heights. 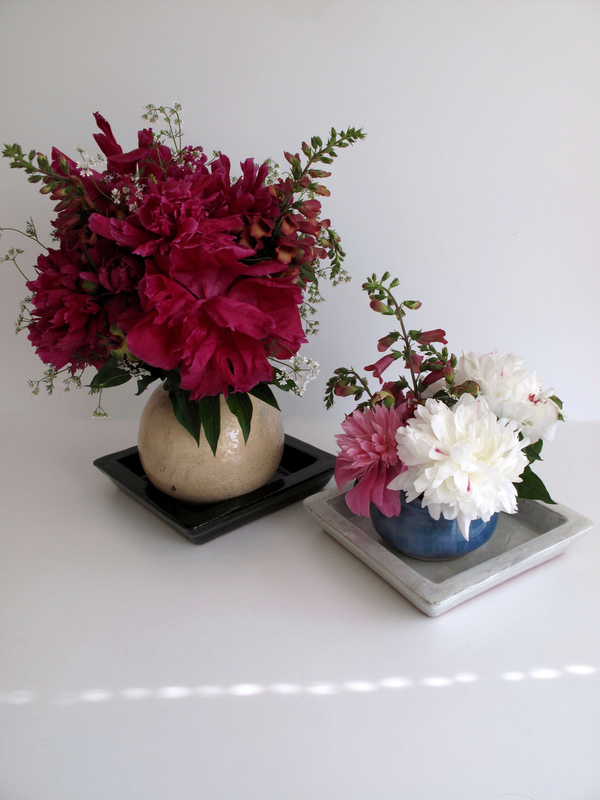 The only foliage used was a small number of peony leaves kept on the stems to help keep them fresh (a tip I picked up from a floral designer’s talk last month). Here is another view after giving each vase a quarter turn. I perhaps like the overhead view best. 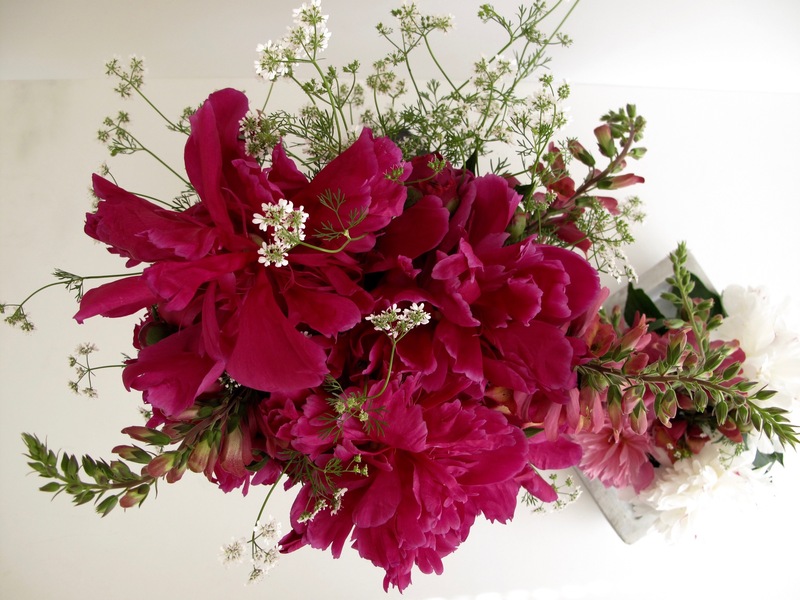 This entry was posted in garden and tagged Coriander (cilantro), Digitalis Foxlight 'Ruby Glow' (Ruby Glow Foxglove), flower arranging, flower design, in a vase on monday, nature photography, Paeonia ‘Festiva Maxima’, peony on May 16, 2016 by pbmgarden. I love red and I love Kaffe Fassett’s advice – don’t just use one use fifty different shades of red. It is great advice for making things sparkle especially with a dash of lime green. Hi Ann, thanks for passing along the Kaffe Fassett quote–made me head off to search out his vibrant textiles. Thanks Judy. We’ve had some cooler than normal days mixed in this spring and it has helped keep the peonies around longer. They’ve been a wonder to behold this year–hope yours will be opening soon. Your ‘Cherished Red’ (and your vases overall) are super. I do admire the way you are always so good at arranging and staging your vases. For me the best touch was the little bit of coriander – but that foxglove is wonderful! I can see why you would not normally cut much of it. . Appreciate your comment Cathy. Photographing the vases is difficult for me, always a bit unpredictable, but I like having the Monday vases as a challenge. That foxglove is new this year and is really performing well. Not sure if by cutting some it will be stimulated to continue blooming. My reaction when I first saw your vase was “Wow”!! That deep red is gorgeous and perfect with the white coriander. The foxglove is a beautiful colour too; did you grow it from seed? and does it come back each year? Hi Christina, I really like that foxglove too. Bought three as plants at a garden center early in spring and have been happy with its color. I’ve never had a foxglove come back, although I tried sprinkling seeds from several last year. Gorgeous entries! When we lived in PA, I couldn’t keep my foxglove in check. Here in Missouri, my yard must be too dry or my soil too darn much clay. I love seeing yours, and isn’t it nice of storms that they sometimes give us the chance to bring in flowers we might otherwise not want to sacrifice. Thanks Kristin. Would be a nice problem to have trying to keep foxglove in check. The storm was so strong the other night I’m surprised it didn’t take more blooms to the ground, but was happy to bring in the foxglove for a vase. So beautiful, and not just the colors but the texture of the arrangement. Also, when you have a plant from a friend it always brings good memories. Thanks Stephi. It was indeed nice to get cut flowers from my friend. She brought some other plants that went into the ground this weekend and I shared some with her. Oh Susie I adore the red peony and the little white cilantro flowers are perfect against them….the overhead shot is my favorite too! Thanks Donna. Was glad to have the cilantro to use for contrast of color and texture against the peonies. Hi Cathy, yes that color is pretty accurate, leaning a bit toward magenta in bright light. Glad I happened upon that foxglove at the garden center in early spring. Took a chance on the color but would definitely choose it again. I have pass-along peonies from my mother-in-law and enjoy them every year, Susie. I like your full rounded arrangements, and the foxgloves add a nice touch of smaller flowers, as well as the wispy Cilantro flowers. 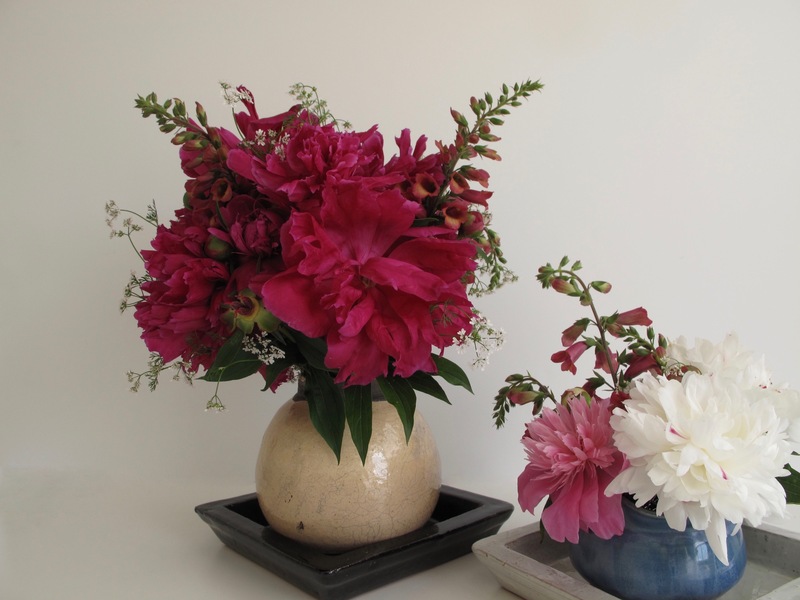 I have a pink poufy peony as well, I will have to check its progress for cutting, yours is so pretty in the vase. Thanks Hannah, pass-alongs are so special. Hope you’re having a good peony season. Our weather has been cooler than usual this spring so the peonies have lingered–such a treat. Peonies are beautiful in all their incarnations and you’ve accentuated them perfectly with the foxgloves and cilantro flowers. The round shapes of the two vases ties them together well as a vignette too. I expect you have a massive vase collection, Susie! I know you’re an admirer of peonies Kris, so you’ll understand how wonderful it was to have a friend bring me this large bouquet. Am pleased with that foxglove this year. The cilantro never was usable last year (bolted right away) but it has been flowering for a few weeks this spring. I needed the pot for something else so was happy to incorporate it into Monday’s vase. My vase collection has definitely grown in the past 2 years! What lovely strong forms as well as colours. Great judgement that the foxglove could take on the glorious frilly peony and enhance it. It is a beauty. Thank you. 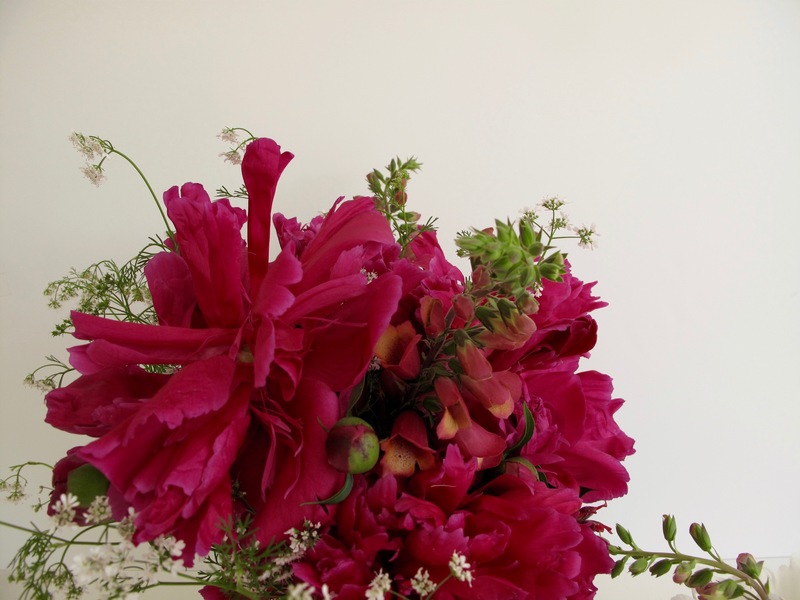 Was happy to have the spikes of foxglove to counter the shape of the peonies. Thanks. These being a gift are even more special. Such a gorgeous red peony! I think the foxglove compliments it perfectly. Peonies are one of my favorite flowers – I can hardly wait for mine to come into season! Will look forward to seeing your peonies Eliza. The rains this morning have knocked off most of the remaining blooms on mine but they were certainly fun while they lasted. Always sad to see them go. Love the idea of using herbs in arrangements. I also like the smell of cilantro (and taste) and find it odd that some people do not. That cilantro hadn’t done well last year so I continued to buy it instead; glad it became useful this week for the vase. I really like cilantro also. Your peonies are simply stunning Susie. I love them, but I have never tried using them in an arrangement. Absolutely gorgeous. Your new one is a fabulous colour. Thanks. These cut peonies were a nice gift. They last pretty well as cut flowers and make a huge impact (plus you get to enjoy the fragrance). Yes, wish I’d thought of that: cherry brandy! I’ve used peonies the past few weeks with and without the leaves, but honestly can’t say I noticed a difference. Two lovely vases, foxgloves and Peony, two favourite flowers. Your two vases complement one another perfectly, while the square saucers tie everything together. Lovely, as always. And thanks for the tip about foliage keeping the flowers fresh longer. Thanks Ricki, so glad I bought those square saucers recently–very useful. I heard the tip about the peony leaves but have been unable to find it in writing anywhere. Still have to remove any leaves that would be in the water. Gorgeous, gorgeous! My Peonies haven’t bloomed yet, and I’m so looking forward to it! Your arrangements are so graceful. Thank you Beth. Hope you have a great peony season this year. Our cool spring extended the bloom time here. Both arrangements are really lovely but I really love the softer tone of the pink and white peonies. Both were long-lasting. Actually after the photo shoot I separated the arrangements and used them in different parts of the house, enjoying their fragrance for a long time.